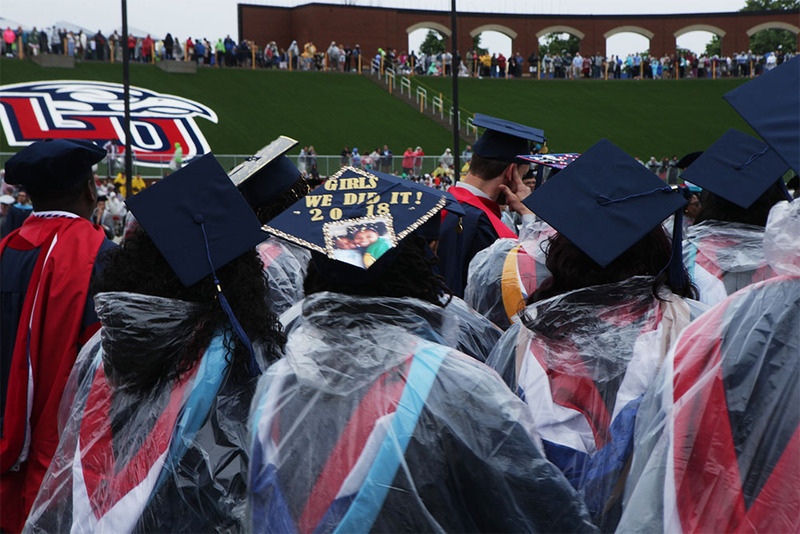 A rainy Saturday morning brought 20,200 graduates back home to Liberty for commencement 45 in the Williams Stadium. 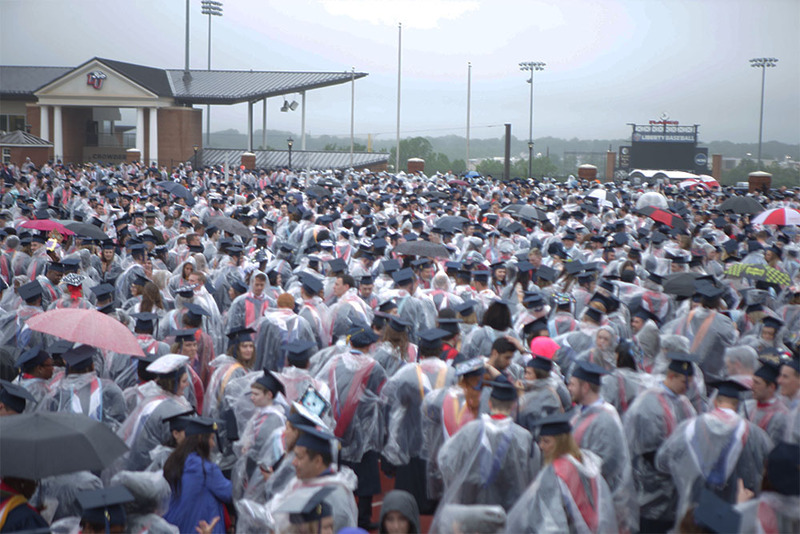 Students and faculty from over 500 LU degree programs flooded the Flames field and waited patiently, regardless of unfortunate weather, for former U.S. President Jimmy Carter to address the crowd. Carter was personable and warm, joking that the audience was bigger than last year’s crowd whose honored keynote speaker was President Donald Trump. “I don’t know if President Trump would admit that or not,” Carter said. Laughter rumbled through the crowd. Carter’s passion for human rights inspired graduates to follow the perfect example of Christ and to serve their community. He showed great courage when he turned his back on the Democratic Party when he disapproved of government funds being spent on abortion. Notably Carter also started the Carter Center and spend a week each year completing a Habitat for Humanity home. He also has a Nobel Peace Prize to his name. The former president has taught Sunday school for decades and comes from a humble Georgian background. The proclaiming evangelical rattled the political arena in 1977 when as a Bible-believing Christian he sat in the Oval Office as a Democrat. “One of the things we have to learn is how to get along, to do good for one another … in other words, just following the mandates of the Prince of Peace,” Carter said. Carter asked graduates to recognize the need for unity in the United States. “The partisan divisions and the racial divisions in our country are becoming deeper and deeper,” said Carter. Carter humbly confessed his failure to unite Southern Baptists at a convention earlier in his career. One of the issues on the table was the equality of women. Carter said that Southern Baptists should not be alienated from one another. “I’m glad to say, our common faith, worshiping Jesus Christ, though is slowly bringing us back together,” said Carter. Carter ended his address by putting the responsibility back on students. “We decide whether we tell the truth or benefit from telling lies. We’re the ones that decide do I hate or am I filled with love. We’re the ones who decide, do I think only about myself or do I care for others,” said Carter. Carter’s passion for equality and loving others was a common theme during the ceremony. Dr. Ben Carson shared the stage with Carter, before he went to address the first graduating class from Liberty’s College of Osteopathic Medicine. Carson said Carter was a model of humanitarian work. “We have plenty of people who are smart, but not a lot of people who care about everybody else,” said Carson. And one of those graduates who has shown they are smart and care for others is Temera Brewer. Brewer graduated May 19 with a Masters in Teaching and Learning – Student Services. Her cap read “Girls we did it!” with a picture of her 10 and 5-year-old daughters. “They have sacrificed a lot,” said Brewer. Brewer went back to school for her masters with the goal of helping potential first-generation college students get the support they need to get into college. Here advise for parents who want to go back to school but are unsure was concise and poignant. The ceremony ended with LU Praise singing a Liberty favorite, “We’ve come this far by faith”. Liberty joins an elite club of colleges who have three-times been addressed at graduation by a U.S. President. The commencement ceremony can be watched again on Liberty’s Facebook page.